AI and ML in Cyber Security - And What Does That Have To Do With Visualization? Adjacent to data visualization are all the different disciplines that help us getting from raw data to visualizations. There are the topics of big data, data mining, and data exploration which come to mind. The world has gotten quite confused and lax about using the terms artificial intelligence and machine learning. Often data mining, for example will be lumped underneath these topics. I have written a few pieces lately that talk about AI and ML in cyber security. They should help bringing a bit more clarity into the approaches and what is suited for the cyber discussion. The topic of data visualization is still a crucial one and I am not doing it justice in any of my write ups. But we shouldn't forget that data visualization is probably one of the most important methods when it comes to helping analysts better understand what they are looking at, and helping data scientists understand what their algorithms have just done. Oh, and should you be interested in Virtual Reality - I just published a short critique of a 'pro VR' article. 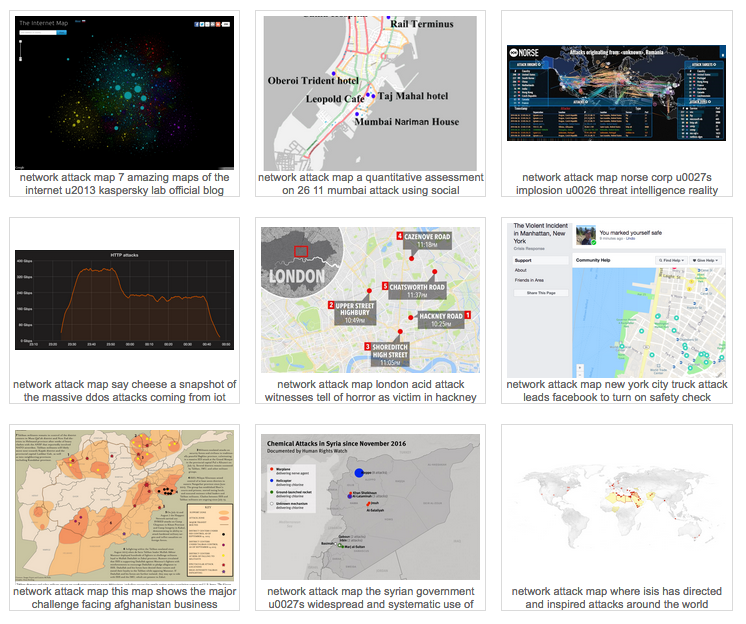 Found a nice collection of network attack maps. 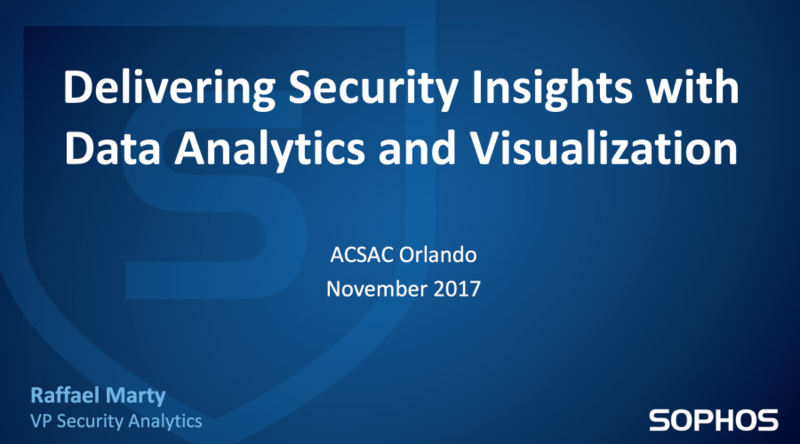 In early December, I gave the keynote at the ACSAC 2017 conference in Orlando, Florida. In the presentation I look at a number of topics around using big data for security. I start by showing what big data looks like for security, how the history of using security for big data is tightly linked to the progress in big data itself. I talk about machine learning and artificial intelligence and show some of the limits and dangers of how we currently apply machine learning in security and how we can apply data visualization to help analysts better understand data. I then go on to peek a little bit into my magic 8 ball to see how security big data environments might look in the future and finish the presentation with posing a few challenges to the community about security for big data problems. 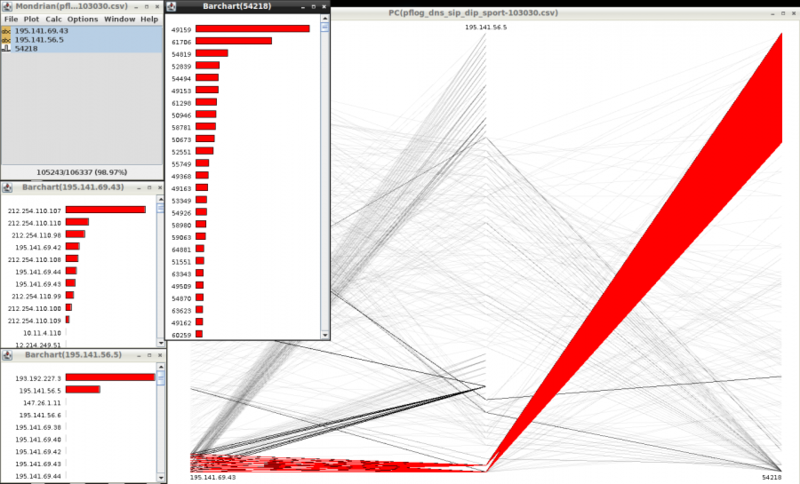 I am a PhD researcher at University of Southampton and my PhD topic is Visualisation in Cyber Security. I have a questionnaire, for my thesis, aimed at people who have experience in Cyber Security, Visualization (or HCI) design or both. I would really appreciate if you can take some time out and fill out the questionnaire. Hi, I am a Phd candidate in Informatics Institude at Middle East Technical University. I prepared an online survey as a part of my phd thesis. However, since this subject is relatively new I can not find anybody who may fill this survey around me in Turkey. The survey is in Google Forms, at link https://goo.gl/forms/xbfmrqJ4jxA4rvQ53. It is not very short :( It may take around 20 minutes but it is easy to fill, mostly composed of multi selection questions. Uncompleted survey results are not saved so the participants should complete the survey. Although we ask questions related to security systems and security visualization systems used to understand the visualization requirements.The survey, in general, does not include questions that give personal discomfort. No tracking information such as email or organization name is asked during the survey. More descriptive information about how the survey results will be used exists in the starting page. So, please do not hesitate to fill, due to your privacy concerns.